1. BEST-CASE SCENARIO: Amy Trask is being honest, and the Raiders are just making a shrewd decision to ensure that they sell out games and keep home games on TV. The Raiders sincerely want to stay in Oakland and this announcement is an equally sincere effort to sell out the Coliseum consistently in a 2013 season when the team is not expected to win many games. Not to be overlooked is the fact that they are lowering ticket prices, which is a good sign that the team understands how frustrated Raiders fans are after 10 consecutive non-winning seasons with zero playoff appearances. 2. SECOND-BEST-CASE SCENARIO: Amy Trask is being honest. But by imitating Lew Wolff’s tarp idea, the team is making a well-intentioned yet bad decision that will hinder ticket sales. 3. SUSPICIOUS BUT CUP-HALF-FULL SCENARIO: The Raiders are not happy with stadium progress and this is a shot across the bow to let Oakland know that they want to get more serious about building a new stadium at the Coliseum complex at 66th Ave. & Hegenberger. There are lots of reasons for Oakland boosters to have hope but the clock is ticking. What’s the reality? If we had to guess (and it’s definitely a guess), we would say reality is closest to Scenario No. 3, but truthfully we really don’t know. The Raiders’ tarp announcement probably might indeed be a well-intentioned but serious error in judgement, much like drafting JaMarcus Russell. But wait, some of you are bound to ask, why are you giving the Raiders the benefit of the doubt but not Wolff/Fisher and the A’s? Well, there are many good and compelling reasons for the difference in reaction. That is because Amy Trask and Mark Davis are saying (and frequently say) they want to stay in Oakland and that they like the site where the Raiders currently play. Wolff, by comparison, has almost always said the opposite, going out of his way to insult A’s fans, the city of Oakland and its market viability while using weak justifications that are so easily disproved that, frankly, they insult our intelligence. 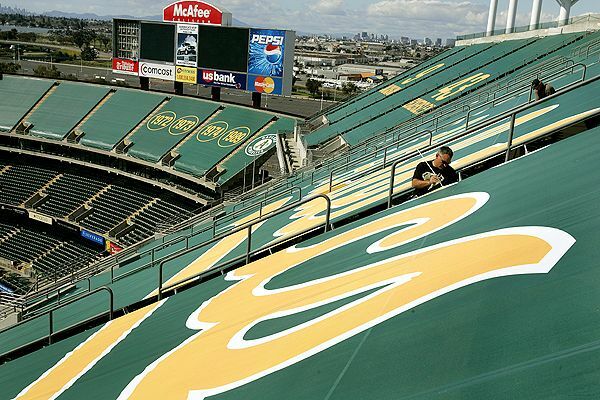 Also, the Raiders are lowering their ticket prices while adding the tarps, which is a sign they might be sincere about getting as many game sell outs as possible at the Coliseum. In contrast, Wolff RAISED ticket prices in 2006, when he added tarps to the Coliseum. Also, Wolff has covered third-deck seats that had good field visibility, while leaving upper-level bleacher seats open, even though they have obstructed views. Each of those non-fan-friendly moves have only created more suspicion about Wolff’s intentions. Though Al Davis generated his fair share of negativity, he also frequently praised Oakland fans, speaking glowingly of “The roar of the Oakland Coliseum” and how it sent chills down his spine during the team’s glory years, when the team had 13 years of consecutive sellout Coliseum crowds. He also won championships and did much to get the Coliseum built and put Oakland on the nation’s pop culture map. Did Davis also waste a lot of the goodwill he amassed in Oakland by suing the city and county and by his increasingly erratic behavior at near-annual press conferences? Yes, that’s painfully true. But at least he built up that social capital for him to spend. In short, despite his flaws, Davis gave at least a little something on which fans could hang their hats. By comparison, Wolff came to town and immediately tried to destroy the bond between the team and the city. And, like his ownership’s negative effect on A’s attendance, it’s been downhill from there. As long as the Raiders and Oakland officials keep trying to work together, we’ll keep giving them the benefit of the doubt. With Wolff and Fisher, they never really tried, did they? Someone should make a meme about that. To be clear, we’re not saying the Raiders have been perfect. Their 10-year playoff drought led to a drop off in attendance last year when the season went bad fast and early. In the previous two seasons, Raiders attendance actually was great; the Coliseum was sold out for nearly every game and on TV in 2010-11, based on just a hint of a rumor of making the playoffs. The last time the Raiders made the playoff was 2002. Given how poorly the Raiders were received in L.A. once the novelty wore off by the mid-’80s (there’s a reason why Davis tried to move back to Oakland as early as 1989), and given the generous loyalty shown by Oakland fans the past 10 years despite many below-average football seasons, we’re flabbergasted that another move is even being considered. At the end of the day, you are reading Baseball Oakland, and we’ll continue to focus on just that — baseball in Oakland. But before we leave the topic of the Raiders, we ask you to consider: We’ve had major uncertainty over the A’s home situation for nearly 18 years. The Raiders have been hinting of moving their team (whether in Oakland or L.A.) since 1979 — that’s 34 long years. We Oakland fans should be weary and discouraged by this kind of shabby treatment from our owners. But we’re not. On the contrary, we are energized and fired up to keep fighting — in ways big and small — to keep our teams in this great, underrated gem of a city. We’re not predicting victory — that would be foolhardy — but we are promising to continue to fight back for this city we love. In spite of all the insults hurled at it, Oakland indeed does have the fans and corporate support and all the other essential factors needed to remain a viable pro sports market. Oakland also has an abundance of things most cities would love to have; the things you can’t buy or measure. Oakland is a great city teeming with soul and with a heart as big as Bill King’s vocabulary. And those are things you can’t cover with a tarp. A’s attendance at the Coliseum is much stronger and more positive than the common perception. Yes, we want the A’s to get a new ballpark and there have been ups and downs over the decades for the A’s, just like the vast majority of MLB franchises. But if your argument is the A’s must leave Oakland because attendance is not ideal right now, then you would be moving about 2/3 of MLB teams at various times in their history. Even the Giants, who are riding high right now? … you might ask. Our answer: ESPECIALLY the Giants. That’s because when the A’s and Giants shared the Bay Area market from 1968-99 and enjoyed mostly equal footing with their respective owners and stadiums, Oakland clearly outperformed San Francisco at the box office. In fact, from ’68 to ’92, it wasn’t even close, as the A’s outdrew the Giants in 17 out of 25 seasons (17 to 8). It’s important to note that anyone criticizing Oakland for its attendance history is not accurate. They are distorting the statistics by looking at A’s attendance in an extremely (and perhaps intentional) narrow vacuum. No, the more accurate answer is found by studying the issue in its proper context — that is, the history of Oakland AND San Francisco attendance when nearly all things were equal between the two teams’ ownership groups and their once-similar multipurpose stadiums while sharing the same market. In other words, the 1968-99 era. Drew more than 2 million fans only three times. Drew above the National League average only once. Drew above the National League median only twice. Never drew better than 4th among National League teams, and they did that only once. Finished in the bottom third among National League teams in 23 of 32 seasons. Finished at least third-to-last among National League teams in 15 of 32 seasons. Outdrew the Giants 17-15 in those 32 seasons, and outdrew the Giants 17-8 in the first 25 seasons they shared this market. Drew 2.9 million fans in 1990, setting a Bay Area single-season attendance record that held for a decade. The New York Yankees did not reach that milestone until 1998, eight years AFTER Oakland accomplished this. The point is, if the Giants can go from being one of the worst MLB franchises in attendance to one of the best — almost overnight — then so can the A’s in Oakland. After all, the Giants’ attendance was mostly awful for more than 30 years in San Francisco, until they moved to their new ballpark in 2000. Yet, the Giants owners took a leap of faith that paid off beautifully for them. Given the statistics noted above, the same thing could easily happen for the A’s in Oakland. That marriage between pro baseball teams and the city of Oakland should be celebrated, not discarded like a pair of old Herb Washington cleats.Oakland’s baseball tradition goes way back to the late 19th Century (the Wide Awakes, and the Colonels) and through the early 20th Century (the Oaks, and the Larks) to the Oakland Athletics of the last four-plus decades. In short, in a sport that thrives on tradition and nostalgia, there is absolutely no reason to throw away 45 sensational years of great tradition and green-and-gold flavored nostalgia of A’s baseball in Oakland.